There is no sitting this one out; you have to do the work. If you have a dog, scoop the poop; be it in your own backyard, on walks, at the park! Anywhere you go with your dog it is your job! If that offends you, hire a pooper-scooper or do not have a dog. Cedar Dog - "Stoop to Scoop, It's You Job!" I want to be doggedly clear, when I wrote my books, I was driven then, as I am today, with the importance of backyard pet waste pick-up. 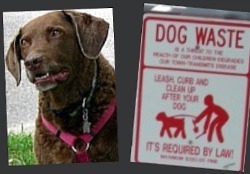 Any municipal dog waste solution begins with dogs and their people. The basics are easy; pick it up, dispose of it properly, don't use plastic bags. If you insist on throwing it in the trash (not an ideal solution) know that it ultimately goes to the landfill. Several of my Colorado Storm sewer buds sent me photos from down-under the streets. In other words if you don't believe me---take a look at these photos of inlets around a park containing pet waste. Besides the obvious problem of contaminating the creek nearby, the bags also plug pipes and cause flooding of adjacent properties. These bags of dog waste did not fall from the sky. 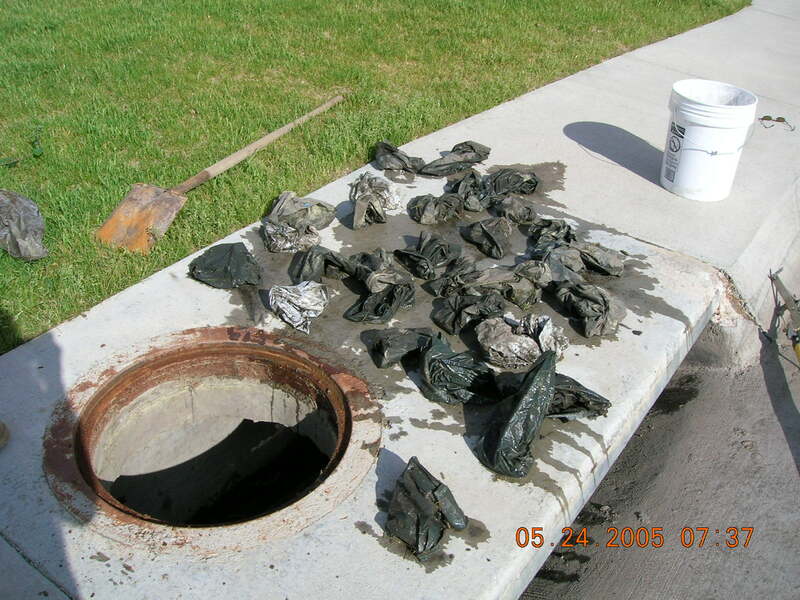 Some human actually disposed of these directly in a storm-water sewer or near enough that rains moved them into the system. Also, consider this; many people encourage and/or allow their dogs to poop near storm-water sewers so they do not have to pick it up. Curbing is the polite term for laziness, aka, shove-it-into-the-sewer approach. Nowadays, you can pick up your dog's waste in a water-soluble, flushable bag. Take it home and dispose of it in the toilet vs. the trash. 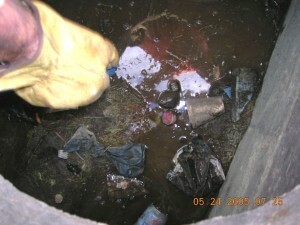 Toilet water goes through a sewage treatment process, designed to do away with harmful toxins. The Environmental Protection Agency (EPA) actually recommends flushing. If flushing the bag makes you nervous then flush the bag's contents. There are a few other eco-friendly disposal options discussed in my books. My fave is vermiculture known as worm composting, or your very own doggie septic system; I especially LOVE this one, a community digester. Remember too, smaller amounts of highly digestible quality food equals smaller stools. Now that is a doggone good plan! PS If you are flushing your dog's waste please write and let me know how it's working for you. It is a sustainable behavior my doggie mind believes is worth learning about and promoting.